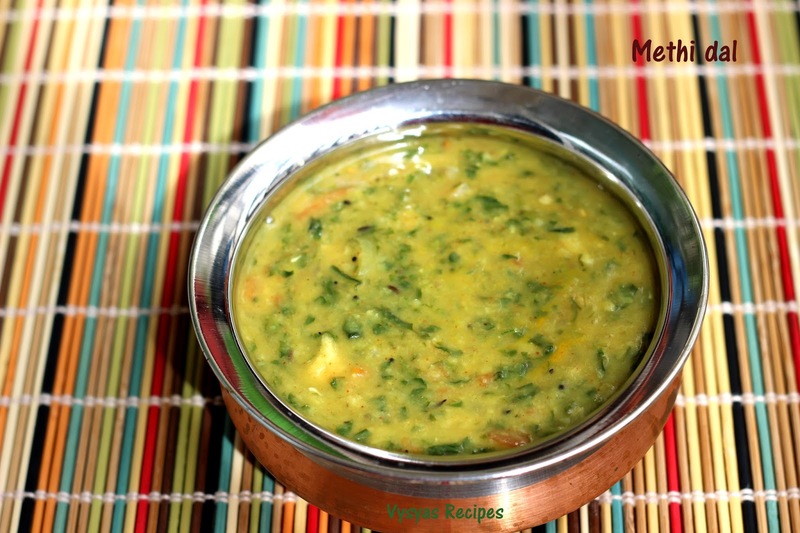 Methi dal is an easy, nutritious and Popular North Indian dal recipe,made with toor dal and fenu greek leaves.It goes well with chapati,roti and rice.Fenugreek leaves are aromatic and flavourful.Fenugreek (Kasuri Methi) is an amazing magic herb that can cure number of ailments.Fenugreek leaves, improves digestion and maintain a healthy metabolism.Feeding mothers will greatly benefits from including fenugreek leaves in their diet. Since it is best for breast feeding mothers, to include fenugreek leaves often in their diet.If you are in a calorie restricted diet, the best bet is to look for dishes that are low in calories, full of nutrients and keep us satiated for a long time. Fenugreek leaves does exactly that, it is very filling, very nutritious and keep us satiated for a very long time. 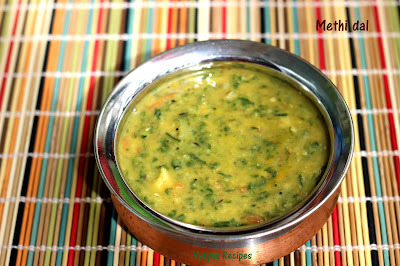 Methi - 1 + 1/2 cup (Tightly Packed). Chop the onions and tomatoes finely and keep it aside. Pressure cook toor dal with needed water and turmeric till soft. Then mash the dal with masher and keep it aside. Wash the methi leaves and chop it finely and keep it aside. crush the Garlic and keep it aside. Heat the Ghee, add mustard seeds when it splutters add cumin seeds. When cumin seeds sizzles, add green chillies, crushed garlic and curry leaves. When Garlic turns slightly golden brown add chopped onions. Saute till onions turns translucent, then add tomatoes. Saute till tomatoes turns mushy.Add methi leaves. Saute for 4 - 5 minutes till the leaves are cooked. Then add mashed dal, chilli powder and salt. Mix well. Add 1 cup of water and cook for 5 minutes, till the desired consistency is reached. Serve with roti, chapathi's or with hot steaming rice. Dal is such a comfort food.. Looks delicious.. Ever classic dish. Always loved. So comforting, healthy and delicious! Lovely share, Gayathri!